The following piece was first published in 2001, but watching Mute Swans in High Park today reminded me of a time when I had a lot invested in these beautiful creatures. 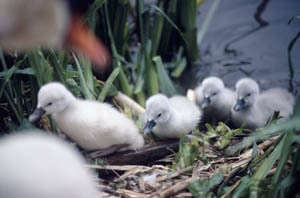 I became part of a group of “swan-watchers” who daily checked on the progress of the nesting, hatching and growth of the cygnets. For hours I would sit on the grass by a pair as they tended to what turned out to be unviable eggs. Still we sat until they were long past due, and I pinned all my hopes on those eggs hatching as a sign that my life in Vancouver would be successful. Here’s a story I wrote for the local paper about the dramatic events that unfolded in Lost Lagoon that spring. 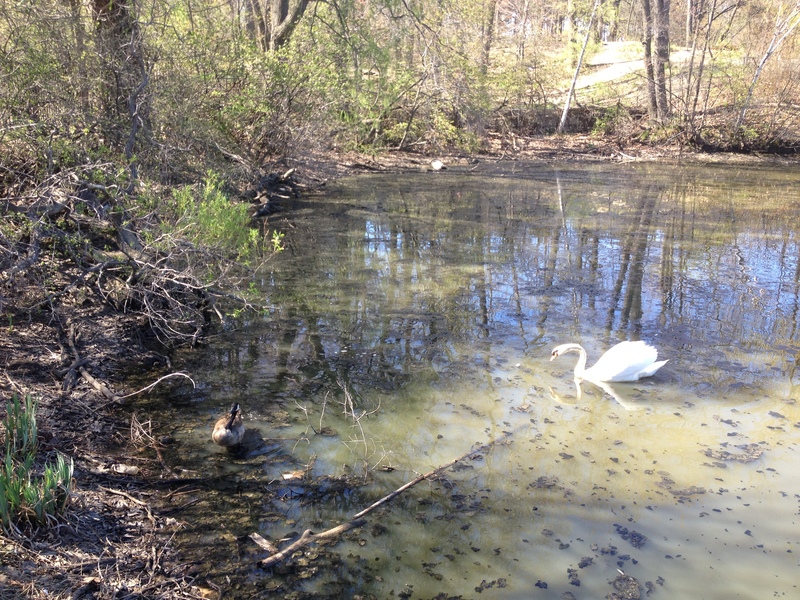 At High Park, a stand off between a male Mute Swan and a Canada Goose. I was reminded because today I spoke to a gentleman who told me that the nest of the pair of swans in Parkside pond had been upset and probably ruined by a few kids who have been regularly fishing on a log shooting out in the middle of the pond, where the pair had made their nest. It’s true that swans mourn their losses, just like humans, so I wasn’t surprised to see their forlorn behaviour today. The male kept a Canada Goose at bay, chasing it across the pond and away from the barren nest, still protecting what had been lost. The female wondered around aimlessly, only reviving herself when her partner came near. I can only hope she has more eggs to lay, though I can’t see a safe place for a nest, among the plastic bottles, discarded pizza bags and other debris. These are delicate creatures and we’ve done them a disservice by holding them captive for esthetic purposed – to beautify our parks – and thereby making them vulnerable to harm while stopping them from living out their natural lives. On June 13th, after 37 days of incubation, four cygnets were born to a pair of Mute Swans nesting in Lost Lagoon. The hatching began at 9 am when the first ball of wet, grey down tumbled out of one of the eggs. At 2:30 pm a second cygnet burst out of its shell, this one ivory coloured, with unusually pink feet and a lighter grey beak that its sibling. Evidently exhausted from their efforts to break free of their embryonic shelters, the babies napped frequently while their parents waiting patiently for five more hours until the final two beaks started poking out of their eggs. The tiny grey “twins,” as they were dubbed, toppled out within a couple of minutes of each other at around 7:30 pm. Delight and relief were immeasurable among a group of Stanley Park “regulars” who had been keeping vigil at three swan nests since mid-April, as if their very presence would send positive energy for a healthy, new generation of Lost Lagoon swans. A week later, only one cygnet remained alive, the three others were killed, eaten or drowned. In the past few years, the hatching, and rearing of swans has been precarious at best, and rumours abound among this dynamic group of wildlife watchers as to why. The Vancouver Parks board characterized this year’s cygnet hatching as a “miracle,” for more than one reason. At approximately 16.5 hectares in area, Lost Lagoon is thought to be much too small for more than one pair of nesting swans, since swans typically require an area at least the size of the whole of Stanley Park (1,000 acres) to accommodate the protectiveness they exhibit while they incubate, hatch and bring up their young. Two other female swans laid seven eggs each but all were lost, allegedly either from spoiling, predators like racoons and otters, or to humans. The four cygnets that did hatch were laid by a young mother who, at two years of age, had supposedly not yet reached reproductive maturity, since Mute Swans usually do not lay their first eggs until at least three years of age. 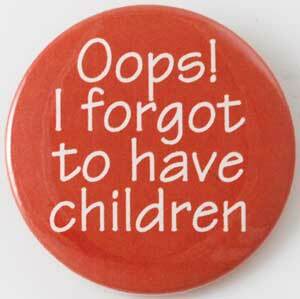 Her partner is estimated to be in his twenties, and to never have successfully parented any young. Although swans habitually mate for life, this male’s partner died last year and it was his first mating season with a new, much younger female. 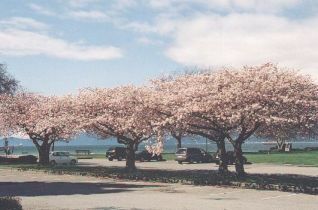 Mike Mackintosh, of the Vancouver Parks Board, who has been involved with the swans in Stanley Park since the 1960s, is not concerned with their low birth rate. “The nine we have now is a much more realistic and manageable number.” In the past they were much larger in number in the park, and were kept company by a few Australian Black Swans that were subsequently stolen, and some native North American Trumpeters and Tundra Swans, that eventually moved on. The Mute Swan is perhaps the most replicated of all the swans species in art, poetry and literature, and commercially in company logos, insignias, and advertising. This is the one species most known to people, due to the fact that it was introduced to North America from England over a hundred years ago, and lives in parks, lagoons and waterways across this continent, close to urban areas. Most Mute Swans are considered relatives to the “royal” English Swans, raised along the Thames River and therefore originally the property of the British royal family, except for a sub species known as Polish Mutes, who have pink feet, compared to the black of the English Mutes and, when mated with them produce a white or light coloured cygnet rather than the usual grey. They are admired for their natural, ornamental beauty (especially when they cup their wings above their backs) and, in their semi-domesticated homes in urban settings, they have learned to have little or no fear of humans, and are therefore susceptible to their attention. The Mute Swans in Stanley Park are the descendants of the original number that were introduced from England in the park’s early history. Although the record keeping on the Stanley Park swans has been poor at best, Mike Mackintosh remembers that fifty years ago as many as seventy-five lived in the natural habitat of Beaver Lake and Lost Lagoon, which both provided plenty of what the Swans thrive on—a vegetarian diet consisting of pond weed, various grasses, and some invertebrates like insects, molluscs and tadpoles. Over the years, through natural attrition due to old age and death by predators, their numbers gradually dwindled. At certain points new swans were introduced in an effort to avoid inbreeding. The Mute Swans are distinguished from the native North American Trumpeter and Tundra Swans by their black knobs that protrude above their bright orange beaks (the knob is more pronounced in the male Mute, than the female). They are known for their territorial nature, especially during nesting periods, and in order to keep them from mixing with or moving the other species out of their migratory spots, the Mute Swans are required by law in Canada to be pinioned. This procedure, which is recommended to be done in the first 2-5 days in a cygnet’s life, but which is carried out three or four months into their life at Stanley Park, permanently prevents the swans from flight. The great debate about whether pinioning is humane or not remains unsettled, but by most accounts it is a relatively painless cut made in the wing of a young bird before it grows its flight feathers, so the swan is none the wiser about its ability to fly. The result is a bird that is perceived to be more domesticated, but which is still governed by the survival-of-the-fittest laws of nature, and any close observer of our Mutes can easily see that these two factors are in constant conflict these days in Lost Lagoon. Among the group of regulars, there are distinctions as to which members have the best interests of the swans in mind, and those who have perhaps too much of an emotional investment in them and have forgotten that they are wildlife, and not mere pets, or worse, human. 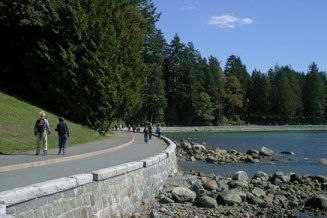 The former are lovers of waterfowl and wildlife alike and respectfully observe, take photos, and chat with other nature-lovers, as well as keep the Parks Board and Stanley Park Nature House (the two on-sight organizations) informed of any harm or mischief being perpetrated on park wildlife. The latter are the repeat feeders, who believe that there is not enough natural food in the Lagoon for the swans and have taken the care and feeding of them upon themselves, sometimes to a harmful conclusion. The unofficial leader of the “swan-watchers” is a woman named Jean who, after many years of keeping an eye on park wildlife, has by far the best memory and documentation of the swans. She also knows who belongs on which side in terms of healthy and unhealthy interest in the swans, and pulls no punches when it comes to telling people not to feed them, get too close, or to please put their dog on a leash. Everyday throughout the spring during the long transit strike, she travelled from New Westminster, walking into the park from the closest Skytrain station and could be found somewhere along the Lost Lagoon path, between the three swan nests. 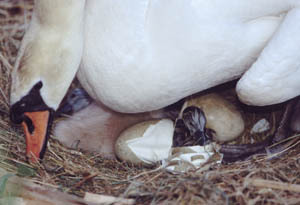 She kept copious notes on when each swan laid which egg and likely knew more accurately than the Stanley Park Nature House staff and the Parks Board itself about when the hatching would begin. She explained to any and all that hatching was not guaranteed and that even if the cygnets hatched, they may not live to adulthood. She happily showed off her photos from last year and she spoke lovingly about how the proud parents fuss over their young, described the cygnet’s first swim, and the way they ride the lagoon on the protective backs of their mothers, their little beaks peaking out from her wings. Her enthusiasm, tinged with sadness for the lost cygnets over the years, easily ignited interest in others about the pending births. 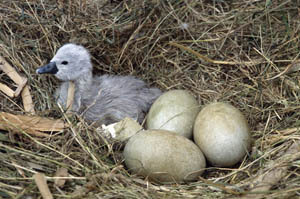 Over the course of the time of the nesting, the group grew in number. Some members were first-timers, some old-timers, and all gravitated toward Jean to learn the latest progress of the swans. By the end of May it looked like only one set of swans would produce the coveted cygnets, and “regulars” could be seen peering over the fenced-off nest closest to the causeway as the hopeful parents stubbornly tended to their eggs, although they were long past their hatching date. Soon, all focus and anticipation was directed to the four remaining eggs in the middle nest. And what had started out as a few people strolling along the Lost Lagoon’s 1 km pathway had turned into a group of people with a common interest meeting to chat about life and nature in the company of the swans. Melanie Beeson, founder of the Swan Sanctuary in Surrey, England advises that our cygnet is quite special as it is in fact a Polish Mute which, she says, tend to be more delicate. “I would say a Polish cygnet tends to need his parents that little bit more. This could be why you’ve lost cygnets in previous years.” She recommends reintroducing the cygnet sooner than later to diminish the risk of rejection. For the first time in many years, the swans basked in the limelight of media attention. 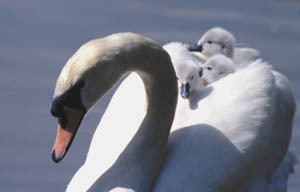 The Vancouver Sun carried a daily account of the life of the cygnets, and both VTV and Global Television featured segments on them. Many regulars were reluctant to speak on camera or be quoted in print and were so protective of the swans and their story that one reporter, sensing a conspiratorial air, commented, “This is about the swans isn’t it?” What was really happening was wariness about the way ordinary people had been implicated in the media as part of the problem, and frustration with the misrepresentation of the swans as vicious, or neglectful parents. 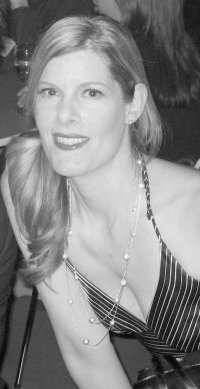 The oft quoted Ziggy Jones claims that she was misquoted in the stories. After allowing the Vancouver Sun a photo of the cygnet in its new home, she is refusing any other media access for the time being. That photo, and another one just published clearly shows the cygnet to be “ivory” the second born with white down and pink feet, who possesses the less common genes of the Polish Mute, and therefore is a rarity. “No,” says Ziggy, “it’s the second lightest one.” Several photographs taken by the regulars prove, however, that there was never a second lightest coloured cygnet in the clutch. The others were the typical grey colour, with dark beaks and black feet. All are mystified by this confusion and await the day they can actually see the young swan, whose gender also won’t be known until it is taken to the vet for pinioning in another month or so. In honour of Kate’s 31st birthday today, here’s a piece I wrote in July 2011, just after the newlyweds took their first trip abroad to Canada. The other day I tripped on a busy city sidewalk and fell in plain public view. I can only hope my skirt didn’t fly up as I landed. At the time I was too busy trying to buffer myself from too much injury to notice. Now, anyone who knows me well will tell you I’m clumsy, so tripping and falling is not all that unusual; the one and only time I’ve ever broken anything – my foot – was during a fall from two harmless and not even steep concrete steps. But, my recent tumble is different. It happened because I was trying to BE Kate Middleton. One day after the Duke and Duchess left Canada, and following days of my obsessive royal watching, I tried to emulate Kate’s flawless, confident walk. Instead of the normal cautious stride of a serial klutz, head down, carefully watching my step for any potential risks, I breezed along, head high, looking forward. I wish I could tell you my heels were too high, or my shoes were too tight, but no – nothing. Just klutziness and, well, the sidewalk might have been uneven. Something the Duchess likely never has to worry about, what with all the planning and inspections and all the practicing and coaching that goes into being a royal on display to the fawning public and unforgiving media. 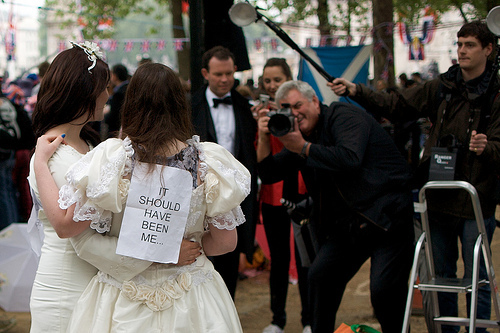 Well, because there’s a little bit of Kate Middleton in all of us, isn’t there? Sure, she’s a Duchess now, married to a prince who will one day helm one of the most influential monarchies around. She’ll likely produce a child who will also one day inherit the throne. Her parents are now millionaire entrepreneurs, but at the time of her birth in 1982, they were airline employees. She’s what is known in British circles as a “commoner” – not so different from the women in the crowd that lined the royal wedding route with signs on their backs reading “it should have been me.” It well could have been. Kate’s 29, born in 1982. I’m 50, born in 1960. There’s no way I could ever be her at this point in my life, but watching her reminds me of the promise that life holds in your 20s, when anything is possible, everything achievable. Life before too much heartache; thwarted dreams, lost jobs, men, parents, friends; events that can affect even the way you stand, and walk in the world. I realized, watching Kate, that I’ve developed a hunch – part weariness, part self-protectiveness. It’s been awhile since I approached my life with the confidence I once exuded, with the poise my mother insisted I learn, with the spark constantly remarked upon and admired. And, I honestly never thought life could drag me so far down that it would show in my countenance. In fact, my mantra has always been, “just keep moving forward.” Yet somewhere along the way, I stopped doing it, no matter how often I give this advice to others. Of course it didn’t immediately occur to me why the royals gripped me so strongly. But now I see that they look exactly like I used to feel. Happy, friendly, looking out, focused on the moment, ready for anything, generally game for life. Prince William is compelling enough on his own – born and bred to one day be King, adored and protected by his mom, Diana, Princess of Wales, he was probably one of the most photographed babies ever. Who can forget his silent, heartbreaking walk behind his mom’s coffin after her tragic death? We felt invested in his growing up, his success at school and his struggle to learn to live within the stricture of his destiny. We watched and waited to see who William would choose for a partner. And though we saw all the tabloid “waity Katy” fluff, depicting her as a woman he trifled with and didn’t intend to marry, when they finally became engaged after eight years of dating, living together and one very public break up, everyone began to focus not just on what Kate wore, but on who she really is. Who is this steady, calming influence on our beloved Wills? We caught glimpses of her on their wedding day – elegant and glowing, she looked to the entire world nothing but ready to become the Duchess of Cambridge, with all the attention – positive or negative, and service that is involved in being a member of the British royal family. But, it wasn’t until she stepped onto Canadian soil for her first official Royal trip abroad with her husband that we saw her true nature. Leading up to the wedding I wrote a number of feature articles on the plans and preparations and I’ll admit it, I kind of fell in love with them. Now, since I’m a journalist I’m supposed to be naturally wary, or jaded or something that I can never quite pull off. So the thing is, they looked and seemed so down to earth, that I believe I was seeing one fairly normal human being, who just happened to be born Royal and bred to be King. And one natural beauty that just happened to appear in his sphere and become the object of his affection. Some have said Kate Middleton quite strategically became Catherine, Duchess of Cambridge. That she set her sights on William at St. Andrew’s university where they both studied, and manipulated her way into his heart, that her mother helped her come up with ways to ensure she’d one day marry that prince. Tell me, though, what teenage girl doesn’t dream of marrying a prince, real or figuratively? And if you happen to live in England and are around the same age as him, sure you’d have his photo on your wall. “Harry Hunters” have had the “spare” prince squarely in their sights for years. These are girls, mostly from abroad, who enroll in British universities and then track down Prince Harry in clubs for a chance to meet him. At 20, when Prince Charles and Lady Diana were married, the younger Prince Andrew attended an Ontario boy’s school in Lakefield, where my best friend lived. We weren’t aristocracy like Diana, but we felt sure we had a chance with him. We may not have had the breeding but we did have the poise, the manners and, most important, pureness of heart. The princess dream starts early and dies hard, or never. Now, I’m not looking for a prince. One good man will do. And that’s something else about Kate and my sidewalk tumble. The dapper Prince is entirely protective of his bride. Never too far from her side, he often extends a reassuring hand to her back. Since royal protocol restricts too much, or any PDA, this is his way of letting her – and us avid watchers looking for signs of affection – know how he feels (I don’t want to even talk about the adoring and knowing looks that pass between them). They are obviously in a true partnership. They are clearly there for each other. Since stumbling is par for the course for me, I’m usually pretty good at catching myself before I fall. This time however, I walked beside a male companion – someone I’ve spent a good deal of time with, whom I trust and care for. As I began to fall, I reached out for assistance, grabbing his arm with my hand as I went down. He let it go. He didn’t catch me; he said he thought I would catch myself. Come to think of it, if there’s anything strategic about Kate Middleton’s behavior it’s that she was smart enough to leave a man who exhibited ambivalence about her. And he was clever enough to look inside his heart and out at his options, and see he had a good thing going and went back to get her. 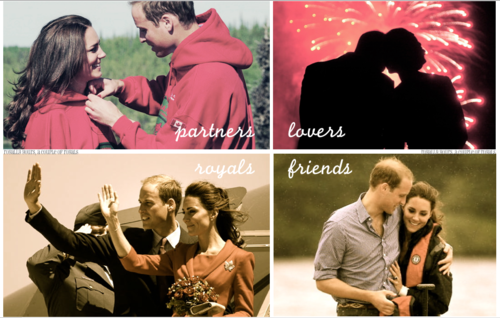 So, what I learned from Kate Middleton is something I used to know. A little thing called confidence goes a long way to achieving the rewards you want, and deserve. Is it possible to suffer a broken heart because of a failed relationship with the city of your dreams? Moving home from Vancouver almost a year ago was like saying goodbye to a lover I didn’t want to leave, but with whom I knew there’d only ever be heartache. It’s not surprising then, that I would be filled with a longing that is most times very difficult to put into words. If you haven’t lived in a place that doesn’t get ridiculously cold and, worse, barren for 6 months of the year, then it’s hard to understand what you’re missing, or even that there are liveable, viable places like that in the world to conduct your life (that aren’t resorts, I mean). If you have, then this would be the longest winter of your entire life!!! Sweet and helpful people tell me that it’s been a good winter, not too many cold snaps or snow, but that’s really besides the point for me. In October when the leaves started changing colour (admittedly pretty), and then falling off (oh dear! ), I knew I was in for a long lush-less period of browning grass and cold, dark concrete, dirty, slushy snow that hangs around for eons. But I never would have anticipated the impact of it on my psyche – I guess I thought, well I was born here and survived 39 winters in a kind of desolation I never named, because I didn’t know any damn different! So, what’s the problem? Well,, I only learned to appreciate nature by waking up to its unrelenting beauty every day. It really does change your whole perspective! Lovely Desiree, my friend in Vancouver, said last night, “well, it’s raining here.” Another well-meaning friend commented, “We have our own weather issues… it’s cloudy” Um… big flippin’ deal!!! My umbrella has been sitting under my work desk for months now, and I would kill to be able to use it over dragging on coat, scarf, hat and boots for the 5th month in a row!!! My dear West Coast friends, you probably don’t know this but RAIN and cloudiness is far better. You see, it means things are green, spring comes early and it never gets all that cold. Each region of Canada has a way (and means actually) of life that is based purely on geography and climate. A road trip across the country is the best way to understand this. The things that concern us here in the centre of the universe don’t even register on the radar of rural Albertans, prairie folk, Islanders or west coast dwellers. This is the main reason why both sides of the country feel alienated, to one degree or another, by a centrist government and media. Who can blame ’em? Folks in Vancouver have impeccable shoes, hair and very clean cars. Nothing is weather-beaten. It’s one of the first things I noticed, with pleasure. By the time I left Toronto 6 years ago, I had grown to hate winter and that fact was a big influence on the decision to live in a part of our country that pretty much skips that season. I guess I forgot that part! Last week I spent a day at Canada Blooms, a gardening trade exhibit. We were shooting stories for the tv show I work on and it sure felt strange to have to go inside at this time of year to see trees, waterfalls, streaming rivulets and flowers. It was so out of context for me that some of the displays looked downright funereal. At first struck by the crowd, I soon realized I was one of them, desperate to see green, growing things; willing to drop any amount on whatever it takes to make my 2×4 Toronto garden look lush for as long as possible (AND I DON’T EVEN HAVE ONE). Here’s the crux of it: I never want to be a person who feels desperate for anything, least of all for want of a pretty flowering tree to gaze upon. But there’s also a deeper psychological issue at play here. I was brought up in a household full of extremes where I perfected the art of crisis management in order to feel any semblance of normal. 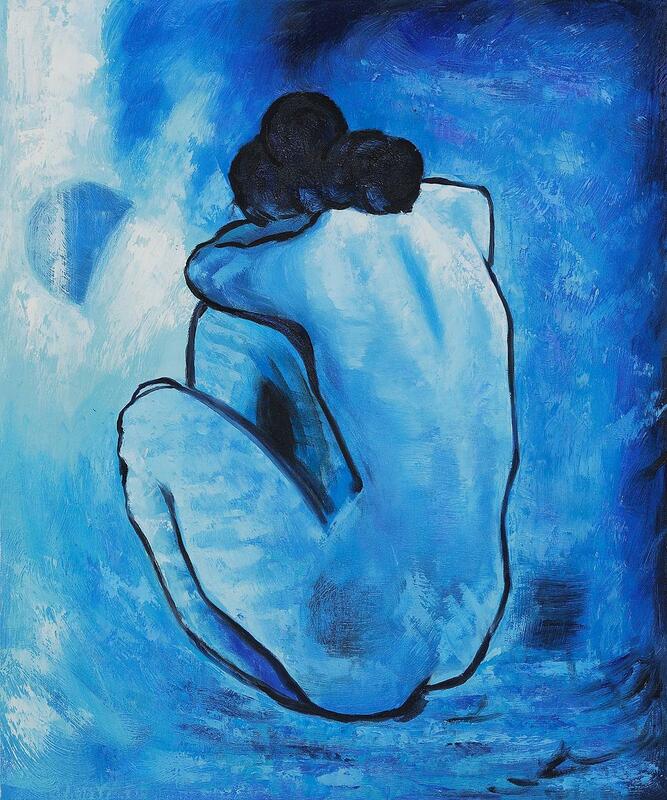 To step out of the spiral I figured out that the extremes in weather too closely mirrored my early life. I had to find moderation in all things – the ubiquitous balance to which everyone here gives lip service. As crazy as it sounds, for me that included weather, maybe even started with it. I thought I had succeeded , so this winter (and the horrific heat and humidity of this past summer) have been as much a test of endurance, as a barometer of personal growth. 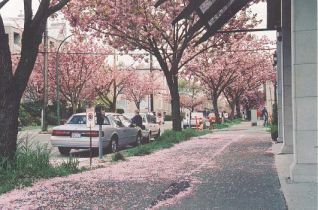 The truth is, as beautiful as Vancouver was and is, I could never quite find a way to make it feel like home. Had I been able to conquer that I would never have left. It was truly the biggest bout of unrequited love I’ve ever experienced. Geesh, you’d think I’d be happy it’s over! Still… Spring has never been more welcome, and having said that I will rest my fruitless and exhausting comparisons and just find a way to make peace with my decision to live here. 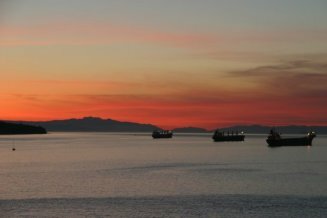 For a long time it’s been my intention to write about my time spent living in Vancouver (2000-2006) but for one reason or another I never have. Since Vancouver is my unrequited love, it might have been a bit painful for awhile. But in honour of my visit there later this month, and as a primer for it, I offer these small memory vignettes. In my freelancing writing quest in Vancouver, one magazine that I pursued had a “Take That Toronto” column. My idea was to write a short piece on how perfect everyone’s hair looked and how immaculate their shoes were. The editor wrote back telling me “Vancouverites don’t need to be told we have great style, we know we do.” Well, she told me! But if you’ve ever lived in Toronto, with its humidity, over-treated, hard water, and snow and salt then you can appreciate what I meant. I never understood the term “manageable hair” until lived in the land of soft water. It was softer, shinier and for the first time I could use “product” in it without worrying about buildup. In Toronto my hair was always BIG. That it could, or ever would be any different is one of those happy discoveries that, while not life-changing by any stretch, certainly goes a long way to making your aging self feel better. The shoe thing is just a matter of getting longer life out of a pair of shoes or boots due to little or no snow or salt. That means you’re more inclined to spend more on them, hence the well heeled feet of Vancouverites. (you could say the same about their cars actually). Moving to Vancouver coincided with the first time since I was a teen that I grew my hair long, so having it so easy to take care of was a delight. In fact, I didn’t go for a haircut until about two years in. You can read about that harrowing experience in a piece I wrote called Of Human Blondage . That’s where Martin Hillier let loose my curls – yes, curls, which I didn’t even know I owned – and showed me how to enhance them with product! Product, I might add, that washes out just fine! Now that changed my life. Let’s just say, men really like curly hair. So as I sit here with a lump of build up at the back of my head, after years of detox shampoos, extra long rinses in the shower and narrowly escaping my own threat to just cut it out and off, I am really looking forward to 5 days of great hair in Vancouver later this week! And even though I cannot afford to get my hair cut and styled for the wedding I’m attending, I do know that no matter what, my hair will feel soft and look shiny clean! No buildup!